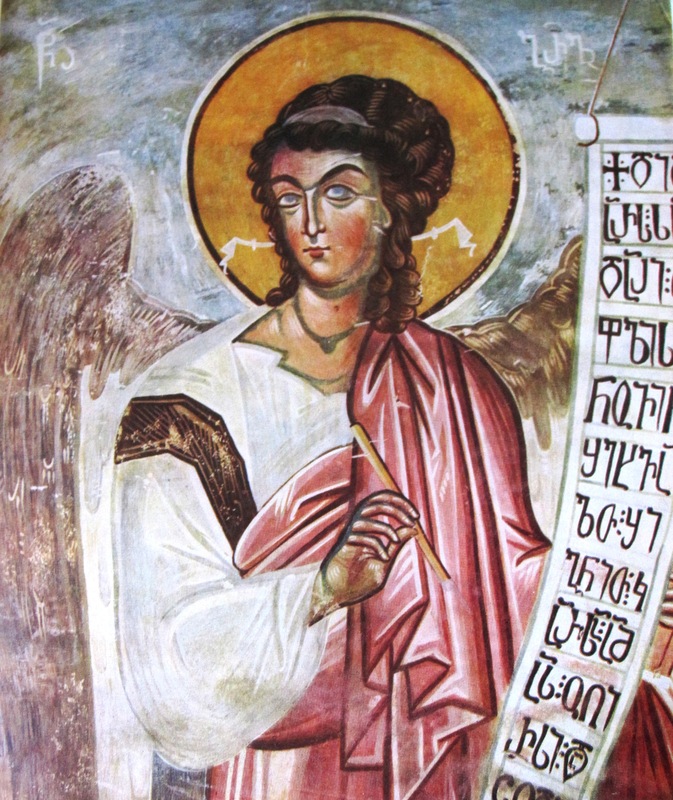 Gabriel in a fresco from the Tsalenjikha Cathedral by Cyrus Emanuel Eugenicus. 14th c.
The Angel Gabriel (גַּבְרִיאֵל , جبريل) is known throughout the Abrahamic faiths of the world. An archangel by tradition, if not by rank, Gabriel sits at the hand of God. He is called Saint Gabriel in many of the Orthodox Christian Churches, and is the patron saint of messengers. As a Messenger of God himself, Gabriel is one of the few Heavenly Host who communicates with people directly, often appearing as a mortal man. Gabriel is also a warrior in many traditions, fighting not only in celestial battles alongside his brother Michael, but also on Earth, assisting the prophet Muhammad with strategic advice in many military campaigns. ISLAM: In the Qur’an, Gabriel (Jibra’il) delivers the Qur’an from God to His prophet Muhammad, and appears frequently throughout that sacred text. 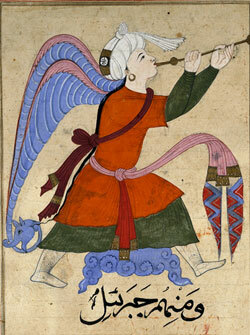 In Islamic tradition, Gabriel also assists Muhammad in various military campaigns. BAHA’I: In the Kitáb-i-Íqán (The Book of Ceritiude—the Bahá’í faith’s primary theological work), as in many other sacred texts, Gabriel is a messenger of God. LDS (MORMON): The angel Gabriel and the prophet Noah are one and the same in Latter-Day Saint theology. In his mortal life, Gabriel uses the name Noah, reserving the name Gabriel for his Heavenly manifestation. JUDAISM: In the Tanakh, Gabriel (“the man in linen”) is the angel in the Book of Ezekiel sent to destroy Jerusalem. in the Book of Daniel, Gabriel interprets the prophet Daniel’s visions. KABBALAH: In Kabbalah tradition, Gabriel is identified with the sephirah of Yesod in the Tree of Life, and works with Michael as a fellow archangel at the hand of God. CHRISTIANITY: Gabriel is mentioned in the Bible in the Book of Luke. He is one of only three named angels in the New Testament, the others being the archangel Michael (Jude I,9) and Abaddon, the “angel of the Abyss” (Rev IX,11). Gabriel foretells the births of both John the Baptist and Jesus of Nazareth. 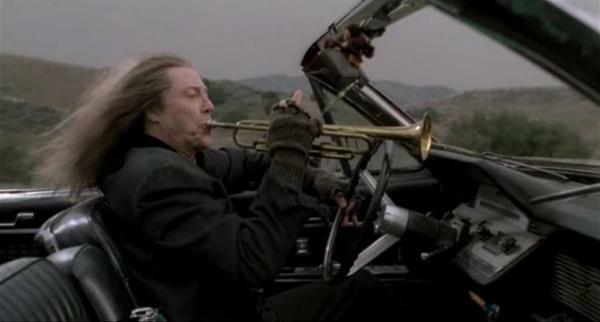 Walken as Gabriel in Prophecy 3: The Ascent, 2000. Gabriel is a central figure in Milton’s Paradise Lost, Rushdie’s The Satanic Verses, and Pushkin’s Gabrieliad. In the talent-packed 1995 film The Prophecy and some of its sequels, Gabriel is played by Christopher Walken. In the first film, Gabriel is attempting to destroy the human race so that the seraphim will again be God’s favorite creatures—The Prophecy’s Gabriel is a terrifying and jealous enemy of all mankind. Walken’s performance is a creepy delight. 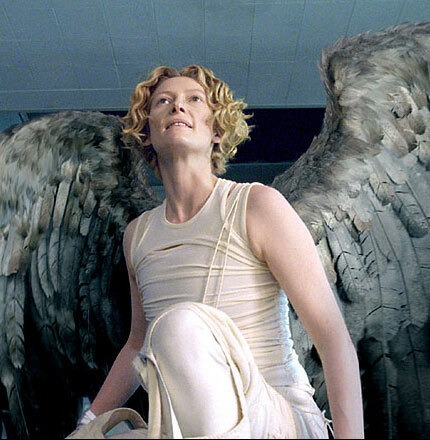 Swinton as Gabriel in Constantine, 2005. In the 2005 film Constantine, based on the Hellblazer comic books, Gabriel is played by Tilda Swinton. Nicknamed “The Snob” by Constantine, Gabriel is a “half-breed”—a rare angel or demon that walks the earth in a possessed human body. 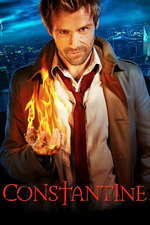 Constantine’s Gabriel is androgynous, vainglorious, destructive, and like most angels, lacking in any sense of empathy for humans. Swinton plays this incarnation of Gabriel to perfection. Lucifer: So you’re willing to die for a pile of cockroaches. Why? Gabriel: Because Dad was right. They are better than us. Lucifer: They are broken! Flawed! Abortions! Gabriel: Damn right they’re flawed. But a lot of them try to do better—to forgive. I’ve been riding the pine a long time, but I’m in the game now. And I’m not on your side, or Michael’s. I’m on theirs. Speight as Gabriel on Supernatural, 2009. 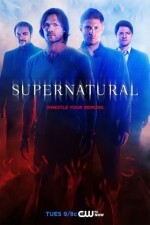 Gabriel (and Speight) are Supernatural fan favorites. Gabriel’s role as the Patron Saint of Broadcasting and Television is used to entertaining effect in the episode “Changing Channels” (E05E08). These three are our favorite (and some of the scariest) portrayals among the many appearances of Gabriel in popular media. Although when Gabriel appears to Zacharias, father of John the Baptist, he cautions Zacharias to “be not afraid,” we are not sure this would be wise advice in the event of an encounter with Gabriel. Perhaps one should be afraid indeed.